Broiled crispy salmon skin, daikon sprouts, cucum­ber & yam­agobo (a pick­led root veg­etable with snap), rolled in sea­soned rice and toast­ed sea­weed. Topped with green onions and boni­to. Served with ponzu on the side. 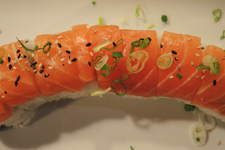 Can be made as a roll, hand roll or sal­ad. Our Cal­i­for­nia roll, fea­tur­ing imi­ta­tion crab, avo­cado and cucum­ber rolled in sea­soned rice and toast­ed sea­weed, gar­nished with raw salmon on the out­side. 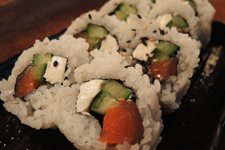 Cream cheese, cucum­ber and smoked salmon rolled in sea­soned rice and toast­ed sea­weed.